Missouri became a state August 10, 1821, the 24th state admitted to the Union. 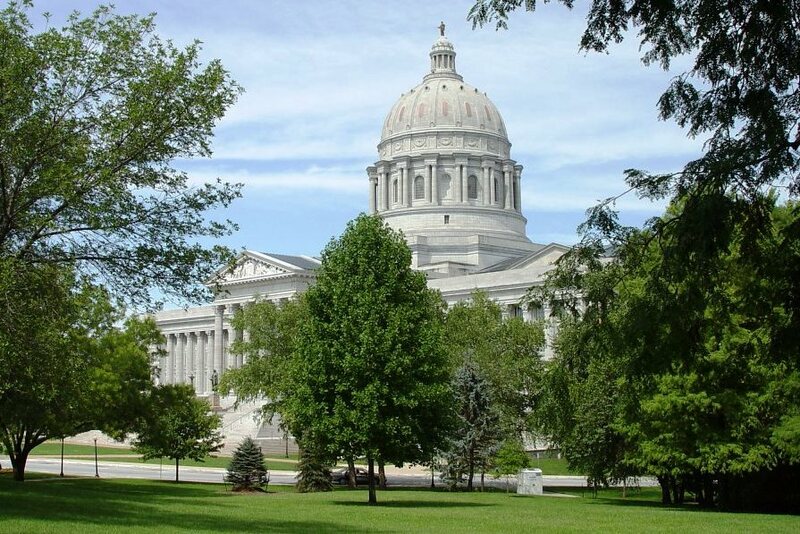 In 1822 the State of Missouri honored Thomas Jefferson by naming its capital the “City of Jefferson” and locating it on the limestone bluffs above the Missouri River. The Louisiana Purchase, the great westward expansion, and the legacy of Lewis and Clark’s Corps of Discovery all played a part in that decision. The 238-foot capitol dome is the first sight you see as you arrive in the city. On the capitol grounds is a 13-foot statue of Jefferson near the south entrance. The State Museum occupies the first floor of the capitol. Nearby, trails on the bluffs of the river are marked with spots where Lewis and Clark climbed. Lead Mine Hill is referenced in their journal, as well as the Indian pictographs and a pierced rock formation near Rocheport. Flood control is a major concern of city planners today. The all-American look; the flag-lined sidewalks and petunias blooming everywhere; the patriotic concerts on Memorial Day; the capitol on a bluff and its expansive grounds; the well-organized history tours; weddings in the park; a community involved, and proud. Mountains near: Ozark Mountains. Taum Sauk Mountain, in the southeast part of the state, is the highest point in Missouri at 1,772 feet.